Today sees the launch of Viber, a brand new, free iPhone application (iTunes link, or search for ‘viber free’) that basically functions the way pretty much every iPhone user wishes Skype’s mobile application would. My educated guess is that this will become a stunningly big hit in no time. 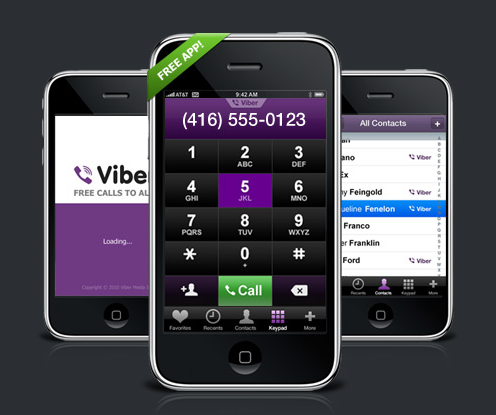 Viber for iPhone allows you to make 100% free calls to other Viber users over 3G and WiFi, is capable of running completely in the background without draining your battery (even when the app isn’t actually running in the background, but more on that later), works over Bluetooth and still manages to boast both speedy call connections and excellent audio quality. Everyone who has an iPhone will want this app – and no, I’m not getting paid by the company to write this, I’m just terribly excited. Because the only thing that would hold Viber back from overtaking Skype’s dominance on the App Store when it comes to free VoIP applications is the fact that it’s a fledgling company, which means it could take a while for people to learn about the app and its capabilities. When you install Viber, the app syncs your phone’s contact list and, by means of a logo, shows you which of your friends are also using Viber. Instantly, you can make free calls to them from your iPhone, regardless of the model you use, no user registration required. Also unlike Skype, the Viber iPhone app promises to not drain your battery when it’s running in the background. I haven’t had the app long enough to thoroughly verify that claim, but I can acknowledge having Skype run in the background on my iPhone 3GS definitely makes the battery run out of juice much faster than it should. The cool thing about Viber is that, even if the app is closed and not even running in the background, you can still receive calls through the service. The user is sent a push notification via Apple’s servers, a ring is generated, and as soon as the user clicks “Answer” on the notification, the app is launched and a connection is made in mere seconds. The company, which was founded by the people behind the successful p2p file sharing service iMesh, says it has dozens of servers deployed all across the globe to handle the load. Good news for Android users: the company is hard at work at a similar app for Android handsets, and aims to release it in the first quarter of next year. Also on the roadmap: free text messaging between Viber users (something Skype and a slew of other apps are capable of today) and possibly a BlackBerry app down the line. Hopefully they’ll come up with a solid revenue model soon, because they’ve done some truly amazing work on this one.